A big thanks to Thomas Witte for scanning, editing and formatting this ebook. 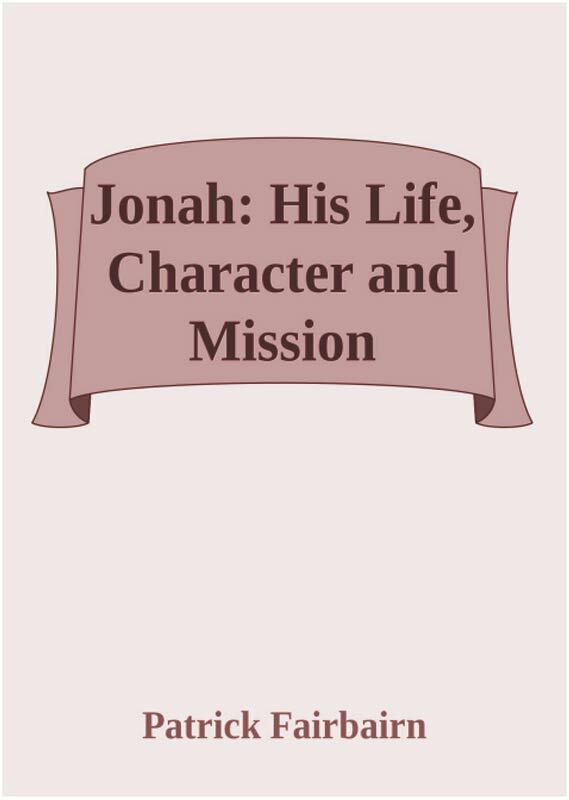 A peculiar and somewhat mournful interest hangs around the life and labours of Jonah, not surpassed, in some respects scarcely equalled, by that which attaches to any other of the Old Testament prophets. The elements both of evil and of good wrought with unwonted energy in his experience—at one time depressing him to the lowest depths, and anon raising him to a kind of supernatural elevation. Cast upon degenerate times, when the foundations of the earth were out of course,-and the kingdom of God was, in a manner, forced to strike out into new and unexpected channels, it was his lot to tread strange and mysterious paths—paths equally remarkable for the sore troubles and the glorious achievements through which they conducted him— though himself meanwhile so ill prepared for the times, or the times so hardly set for him, that the bright, not less than the dark and cloudy, periods of his life served only to feed the well-spring of his sorrow and dejection. Unhappy prophet! unhappy, too, in his posthumous connexion with the world, as well as in his personal sojourn in it; for the troublous spirit that attended him through life seems still to have slumbered in his ashes. Reproach and dishonour have been heaped upon his name amongst men. The adversaries of the truth, and not these only, but also its zealous friends and defenders, have shot many a bitter arrow at him, and have thought they improved the record of his singular history according as they enforced against him charges of transgression, and expressed their abhorrence of his character. Not so "the greater than he," whose servant and forerunner he was, and who once and again pointed an evil and adulterous generation to the wonderful experience and history of Jonah as already containing the elements of his own, and as pregnant with lessons of highest wisdom to those among whom he lived. And, following in his footsteps, we also have sought to honour the son of Amittai, yea, to vindicate his title to a distinguished place among those who have done and suffered much for the cause of God—men of noble hearts and devoted lives—in whose very failings we still discern the lofty and self-denying spirit that animated their bosom. What we have written, however, in the following pages, is not to be regarded simply, nor even chiefly, in the light of a vindication. The aim rather has been to give a clear and just representation of the times of the prophet—of the nature and design of the singular mission he was appointed to fulfil—and of the varied instruction which is furnished for believers of every age by the mission itself, and the manner in which it was discharged. The work assigned this prophet marked in some respects a new era in the providence of God toward his Church; it unfolded principles of government and ways of dealing, which again reappear in other portions of prophetical scripture more fully developed and variously applied; so that the consideration of the book of Jonah, besides the other advantages it yields, furnishes some sure and well-defined landmarks for guiding our way to a sound interpretation of the word of prophecy. To sincere and earnest students of that word the author presents this volume, as a small contribution toward the right understanding of those portions of prophecy which come within its range, and to all in general who desire to cultivate an intimate acquaintance with the records of God's revealed will. May the Lord be pleased to accept the effort here made to discover his truth, and manifest his ways to the children of men!